We are situated 2 minutes off the M6 motorway at Junction 33, towards Garstang and are easily accessed via the Bay Gateway. Whatever the size or style of your garden, if you are in need of some specialist equipment to create or maintain that outdoor space, we will have something to suit you. From ride on tractors to hedge trimmers, Armstrongs Garden Machinery Ltd stock a wide range of high quality equipment and have extensive product knowledge to help and advise. There's a simple reason why you'll see so many Honda products still in use, they are built better to last longer. That's not just an idle promise it's a fact. And it's supported by the longest and most comprehensive warranties you'll find anywhere. 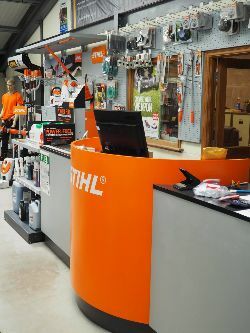 The STIHL name stands for revolutionary technology and innovative ideas, with an 80-plus year history; the STIHL brand is known around the world for quality and service and has made them the world's leading chainsaw brand. Viking products make gardening tasks simply more of a pleasure. With their longstanding partnership with STIHL you can be confident that Viking products are of the highest quality with a comprehensive warranty. Atco have been manufacturing fine quality mowers for the lawns of Great Britain since 1921 and have earned an enviable reputation for outstanding quality and performance. Using engines from the finest engine manufacturers in the world; Briggs & Stratton, Honda and Kawasaki. With a reputation for durability, Billy Goat Industries Inc is the premier manufacturer of commercial grade outdoor power equipment used in debris management. Stiga is well known for the quality and reliability of its lawnmowers, front cut ride ons, lawn tractors and garden equipment. The Stiga name has been associated with lawnmowers, garden tractors, and ride on mowers for 80 years. Don't worry about faulty machinery - all new garden machinery that we sell comes with a full manufacturer's warranty.